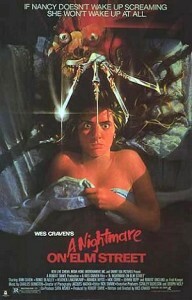 Johnny Depp made his feature film debut in 1984 as Glen Lantz in Wes Craven’s “A Nightmare on Elm Street”. This film was not only the beginning of Johnny Depp’s career in the spotlight but it was also the birth of Freddy Krueger and the Nightmare on Elm Street franchise. Set in Springwood Ohio, a fictional midwestern town, A Nightmare on Elm Street revolved around the lives of a group of teenagers who discovered a death in their nightmare killed them in the real world. As the teenagers try to survive the claws of Freddy, we learn of the parents dark secret from long ago. Johnny’s character Glen Lantz is dating neighbour Nancy who is also experiencing these eerie dreams. [Spoiler Alert…] No big surprise but Glen has a run in with Freddy towards the end of the film and is killed in one of the best horror deaths. As he drifts off to sleep he is pulled into a hole in his bed by the now infamous glove and stripped sweater, along with his TV and everything else on his bed only to emerge as a geyser of gravity defying blood spewing onto the ceiling. Wes craven shows his creativity and genius film making abilities in this scene which you can see below. In 1991 Johnny also makes a cameo appearance in the sixth instalment entitled “Freddy’s Dead: The Final Nightmare”. Also another trivia tidbit, Glen’s death is shown as a flashback in the 2003 film “Freddy vs. Jason”.